The sinister Sidney makes a deal with the Scarlet Widow to purchase the last fragment of the kryptonite meteorite. Meanwhile, Jimmy Olsen is asked to identify the dying man at Linwood Hospital, but Superman’s body has mysteriously disappeared. 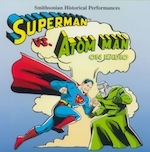 This entry was posted in Radio Yesterday Podcast and tagged Adventure, Super Heroes, Superman. Bookmark the permalink.